'Breakaway' slows things down again in this gritty sensual pure rock, with memorable riffs and well written lyrics, not to mention one classy guitar solo yet again. 'Darkstar' opens on some groovy bass, making for a big impact with emphasised parts for effect, aided by the strong gravelly soaring vocals and chord structures. This features some of the best instrumental sections also, highlighting their strong musicianship skills more-so. Next we have a song about 'Anne Boleyn', the second wife of King Henry VIII. This has a different more mainstream pop feel, with bouncy fast riffs and more clever lyrics to help portray the tale of Anne, and Henry's behaviour towards her, and his other wives. This is delivered in a very catchy upbeat manner, quite strangely. This is a must hear historical lesson! 'Black & Blue' is the heaviest offering, with tonnes of brilliant swagger, and attitude in a extremely catchy rock package, with an old school vibe. So we reach the end with, 'Blood Orange', which is a swooning number, with a slightly sombre feel also. It is quite intimate, helped by an ambient/atmospheric sound, and features beautiful far reaching female vocals to help further stand out, potentially making this the best song yet. This is a great stripped back and delicate way to end this changeable release. This is a highly enjoyable release which is full of flair and attitude, that embraces many different moods and genres in a seamless fashion. Their sound touches on blues, rock 'n' roll, hard rock, punk, and soul elements, giving them a brilliant signature style. The fact that they incorporate so much, makes this an album that anyone can be taken by, with their dark and alluring 'voodoo' curse. 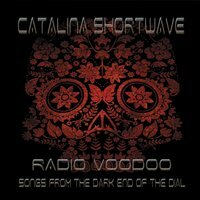 You will easily become bewitched by Catalina Shortwave!